Enver Faja (April 6, 1934 – October 5, 2011) was an Albanian architect and diplomat. He was educated in architecture in the Polytechnic University of Krakow (Poland), but got graduated in 1960 in the Faculty of Engineering in Tirana University because he was forced to leave Poland due to the regime. Immediately after the graduation he took part in the execution of the hydro dam of Shkopeti. For 23 years (1962-1985) he has worked as lecture in Architecture, in the Polytechnic University of Tirana. However beside academic work, he took part in different important public projects. He is the designer of the National Gallery of Arts, The National Historical Museum, The cemetery of martyrs and the Urban Plan of “Students City” in Tirana. After the ’90, when he was appointed ambassador in Poland, he continued working as part time lecture in the Polytechnic University of Tirana. He is author of different publications, including university books, professional articles and articles regarding emerging themes in the main national journals. Artan Shkrell, the head of Albania's Architects Association, called Faja, whose career spanned more than fifty years, "one of the main figures of the Albanian architecture." Faja's design portfolio included the National Historical Museum, master plan of Student’s Town in Tirana, and the University of Tirana's Faculty of Science building. Enver Faja died from a long illness on October 5, 2011, in Strasbourg, France, at the age of 77. 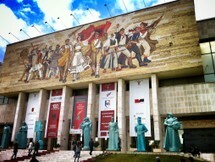 His funeral was held at the National Gallery of Arts in Tirana.